I again continue with this post by sharing some more of the writing of George F. Noyes – a lawyer from Maine who was a part of Abner Doubleday’s staff – and who wrote the following excerpt in his 1863 book The Bivouac and the Battlefield. As throughout this series, the excerpt will be given in italics, whereas my remarks will be contained <in this fashion>. Stretching in front of the fields adjoining our camping-ground was one of the long fence-rail barricades of the enemy, and behind it a continuous pile of straw indicated their sleeping-spot at night. They had left behind them some fifteen thousand muskets, and details of men were engaged in collecting them. The burial-parties were still busily engaged; it seemed, indeed, that their sad work was hardly half accomplished. As we rode on, we met a friend guiding a couple of ambulances; as he was not a surgeon, we inquired his destination, when he told us that during his afternoon ride he had discovered, in a barn on the edge of the battlefield, some twenty rebels so desperately wounded that they had been unable to help themselves, and had therefore remained untended and without food ever since the battle. He was now going with the ambulances to bring the poor fellows into one of our hospitals. 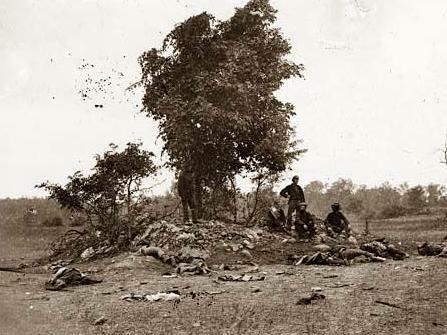 Posted by Randy Buchman on October 19, 2012 in Antietam / Battlefield Guides, Antietam Aftermath Series, Uncategorized and tagged Antietam, Antietam aftermath, Antietam Battlefield, George F. Noyes.